Loaded Powerstroke Diesel! Navigation! Heated and Cooled Leather Seats! Trailer Tow Package! Sony Audio! FX4 Off-Road Package! 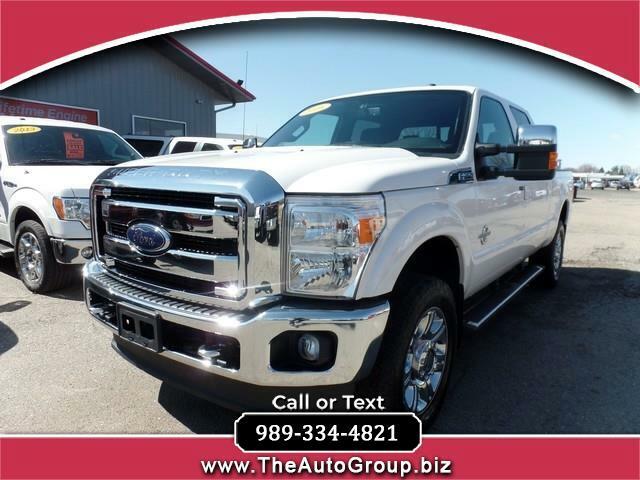 Displayed in White Platinum, our 2016 Ford F-250 Lariat Crew Cab 4x4 is built incredibly strong with great payload and towing capacity. At the heart of our truck is a 6.7 Liter Turbo Charged Diesel V8 that unleashes 440hp and 860lb.ft of torque while paired with a durable 6 Speed Automatic transmission. You ll feel confident in this Super Duty truck that can handle your most demanding jobs with ease, efficiency, and style! Fog lights, a chrome grille, and unique wheels enhance our strong machine. Inside, the Lariat caters to your comfort with luxurious leather seats, wood grain trim, dual-zone climate control, an auto-dimming rearview mirror, and other upscale amenities. Check out SYNC with MyFord Touch infotainment and a Sony premium audio system that keep you up-to-date and let you listen to your favorite tunes as you conquer your day. The F-250 has been carefully engineered with six standard airbags, SOS post-crash alert and Roll Stability Control keeping you safe and secure. Built to make your life easier, our F-250 is the powerful, impressive, and intelligent choice! Print this page and call us Now... We Know You Will Enjoy Your Test Drive Towards Ownership!